Impressive plenary speaker line-up for the 2018 BCPC Congress - BCPC British Crop Production Council : BCPC British Crop Production Council . 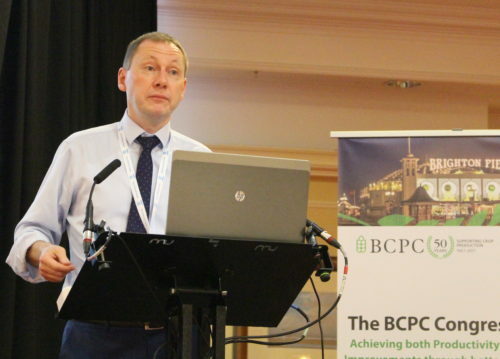 Brexit implications feature strongly in the opening sessions of this year’s BCPC Congress, which will feature talks on the wider implications for UK crop production. This continues the thrust – initiated in the 2017 Congress – to broaden the range of topics to provide information, not just for the Regulatory community but also for the whole arable farming industry in the UK. Speakers include Dave Bench (UK Health and Safety Executive), who will provide the latest information on progress in forming the post-leave UK agrochemical regulatory policy, including outcomes of the recent Defra consultation. Nick Pyke, recently retired CEO of the Foundation for Arable Research, the New Zealand arable levy organisation, will outline how industry and regulators have worked together to develop agricultural production. Glyphosate has had a temporary reprieve in the EU – but is still threatened by politically-motivated elements. Ludovic Bonin, Head of Weed Research at Arvalis, France – the levy funded French technical institute in charge of applied research on arable crops – will discuss technical and economic aspects of a possible withdrawal. As Brexit approaches, these and other plenary presentations will be of great interest to those wanting to get up-to-date on the implications of Brexit for the regulatory and wider crop production community. Including the changes anticipated in the UK agricultural subsidy regime. In line with the increasing Congress emphasis on arable agricultural policy and issues, this year BCPC is collaborating with the Association of Applied Biologists (AAB), who will be holding their Crop Production in Southern Britain Conference in Brighton alongside the Congress, and also with the Agricultural and Horticultural Development Board (AHDB), who have supported Nick Pyke’s and Ludovic Bonin’s attendance. The BCPC Congress, in association with TSGE forum, will be held on the 13-14 November 2018 at the Hilton Brighton Metropole Hotel. The AAB conference Crop Production in Southern Britain commences on 12 November at the Mercure Hotel, Brighton. Details of the BCPC Congress 2018 programme, booked speakers and early bird registration (valid until 8 October) can be found at www.bcpccongress.org.